Your new Corporate Gold Card offers you an excellent range of benefits. Full details of your Card benefits plus your Insurance Documentation can be found in this welcome kit. With first-class service and support, we’re here to help remove the stress from travelling and help make it more enjoyable. This website offers a comprehensive guide to using your Corporate Gold Card. It also provides information on Travel Insurance and the Customer Services you can expect with your Card. In business, some things have to be dealt with there and then, wherever you are. That’s where you Card can help. From travel protection, to making dinner reservations after you’ve landed, the benefits that come with your Card can help you manage it all, effortlessly. Your new Card provides you with a flexible and safe method of payment that helps meet the demanding requirements of the frequent business traveller. When you travel on business with your Corporate Gold Card, you can expect nothing less than exceptional service wherever you go. It gives you access to a great level of service, 24 hours a day, 365 days a year. Your Corporate Gold Card provides you access to over 700 VIP lounges in more than 120 countries and 400 cities around the world, courtesy of Priority PassTM. Annual Priority Pass Prestige Level membership normally costs US$/€399 or lounge visits are charged at US$27/€24 per visit on Standard Level membership, but membership and lounge visits are complimentary for you as a Corporate Gold Cardmember. To be certain of enjoying this benefit, you need to complete and return the enrolment form provided. 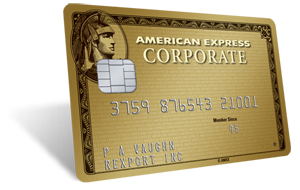 You can access the form for Dollar Corporate Gold Card here and for Euro Corporate Gold Card here. Make sure you don’t miss out, sign up today. Our Global Assist service does not charge you for making any of the necessary arrangements. Cash advances, medical, shipping and other costs are charged to your designated Corporate Gold Card, therefore approval will be sought prior to incurring any costs. The Membership Rewards1 programme is the loyalty programme from American Express that rewards you for using your Corporate Gold Card2. +44 (0) 1273 864 864 . Enrolment is free for the first year and for an annual fee (currently US$/€36.00 inc VAT) thereafter. Please note that enrolment to the programme is subject to your company’s policy and approval. With your Corporate Gold Card, there is no pre-set limit on your spending unless your company sets one. Any Card that has a pre-set limit will be monitored to ensure this limit is not exceeded. +44 (0) 1273 576 141 for Euro Corporate Gold Card. Monday to Thursday – 08.00 to 17.30 GMT, Friday – 08.00 to 17.00 GMT.